Did you know that experts say 80% of skin damage happens before the age of 18? It's true -- and preventing it means more than yelling, "Don't forget the sunscreen!" at the pool. The best path to healthy skin is to cultivate good grooming habits early. Deborah Hernan is a former Revlon executive who found herself perplexed by the gap between gentle for-your-baby products and adults' stop-the-aging-process products. What about those tween years, when girls need to be forming good self-care routines for their hair and skin? Her solution was to start a new company, called Ottilie & Lulu, that offers an array of products for girls 7-14 with gentle formulations of antioxidants, botanicals, and vitamins. With products like the combo shampoo/body wash and facial wipes (both are great ways to stay clean and fresh without wasting time! ), girls are more likely to take responsibility for their own grooming, and you don't have to worry about skin irritation, overwhelming scents, or glitter. It's a beautiful way to start young girls on a lifetime of good hygiene. Hi Daily Grommet Parents. Tween years are the time of great social, emotional, and psychological development. 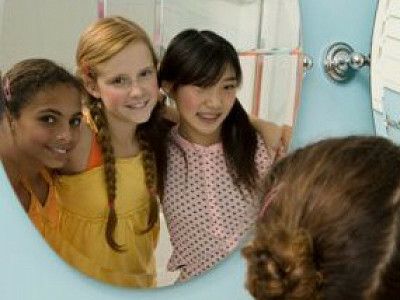 With the onset of puberty and the physical changes that accompany this period, tween self esteem is fragile at best. Now is the time to get them started on healthy habits that last a life time--including daily healthy skin care habits. Since most of the damage done to skin happens before the age of seventeen, starting tweens now with simple, daily skin care will not only help them through the acne-prone teen years, it will also make them feel more confident about looking great naturally. Tweens don’t need the harsh ingredients found in teen and adult products, and they certainly don’t need a lot of products. A simple daily routine of cleansing, moisturizing and protecting skin and hair with gentle, but effective products is what they need. Healthy, clean, beautiful skin is what Ottilie and Lulu is all about. I am here to answer the questions you have. Great product Idea! As the mom of a 14 yr old girl and an 11 yr old girl, I have been dismayed by drugstore brands of skincare. My 11 yr old is just starting a face washing regime, so these products are perfectly timed for her! @jody: \Thank you so much for your comment, Jody. I love hearing from other mothers! Question - Does the shampoo/body wash help if you have really sensitive/dry/itching skin? @nikki: Hi, Nikki, Ottilie & Lulu products are specially formulated for tweens' delicate skin. None of our formulas contain parabens, phthalates, sodium lauryl sulfates, mineral oil or petrolatum. Our ingredients do include jojoba and wheat proteins as well as the Vitamin C to provide gentle cleansing for skin and hair. I think your daughter will like the after-feel of this product. My daughter is fair with sensitive skin, and she uses it every day. Hope this is helpful. Hi, What about the preteen breakouts? Are there any ingredients in your products to help or treat that problem? Product looks great! My daughter will love it. We need a product line for boys the same age, too. Very good question, Christina. Ottilie & Lulu is based on developing regular cleansing habits, and its ingredients are gentle enough so that frequent cleansing can be used to combat preteen breakouts. Salicylic acid is the ingredient found in most teen acne products, and it strips the skin of its natural oils. So if spot treating acne with drying products becomes the habit versus establishing regular cleansing, skin will become unbalanced. And unbalanced skin will become the cycle through her teen years. Ottilie & Lulu does not contain drying salicylic acid. What we would recommend is more frequent, regular (gentle)cleansing--especially after sports. Keep a pack of Clean Skin Face Wipes in her back pack so she can use them throughout her day. If her skin feels oily, suggest she use a face wipe. Additionally, keep hair away from her face--especially during activities and at night. @Gemini: We are always on the lookout for great products to feature as Grommets. If you discover a hair and skincare line for tween boys, we would love to hear about it! Please consider submitting it via the 'Citizens' Gallery' link above. @Deborah Hernan: We want to be one of the first to hear about any of your new developments! We love seeing what our partners do next. Add me to the list of needing a line for boys! Is there a reason that we couldn't use this line for boys? Can you tell me what is in the face essentials gift set and what is in the spa essentials gift set? How many wipes are in the Face Wipes pkg? Do you have a place that details ALL the ingredients in ALL the products? The photo for the Spa Essentials Gift Set doesn't match the list you have. If I bought the wipes $10, Lotion $14, Shampoo $14 and Conditioner $14, I'd only spend $52. Am I missing something here? The Photo shows the Wipes and the 3 bottles, but there is a bag in back, is it just the gift bag it comes with? Is there a Gift set that includes the Face Essentials set and Hair Essentials set, then adds the Body Lotion? I was thinking this was what was in the Spa Essentials set. @Michele Floyd: Thanks for your questions. The additional cost is for the extra large wrapping bag, ribbons, and tissue paper. The bag is big enough to reuse as a jammy bag. There is not a gift set that includes the face essentials, hair essentials and body lotion. This will make a fabulous gift for a young girl! Did you know that experts say 80% of skin damage happens before the age of 18? It's true -- and preventing it means more than yelling, "Don't forget the sunscreen!" at the pool. The best path to healthy skin is to cultivate good grooming habits early. Deborah Hernan is a former Revlon executive who found herself perplexed by the gap between gentle for-your-baby products and adults' stop-the-aging-process products. 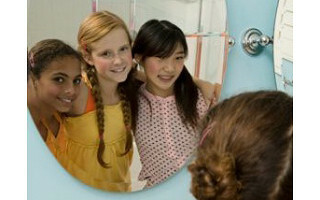 What about those tween years, when girls need to be forming good self-care routines for their hair and skin? Her solution was to start a new company, called Ottilie & Lulu, that offers an array of products for girls 7-14 with gentle formulations of antioxidants, botanicals, and vitamins. With products like the combo shampoo/body wash and facial wipes (both are great ways to stay clean and fresh without wasting time! ), girls are more likely to take responsibility for their own grooming, and you don't have to worry about skin irritation, overwhelming scents, or glitter.